Orders are pouring in to your Ecwid store, due to your clever and creative selling strategies. However, while you happily look at the total revenue numbers in your Ecwid dashboard, a few niggling thoughts occur to you: How many products are selling? Which customers haven’t purchased in a while? What are the top selling categories? And other pertinent questions that you wish you can have the answers to, without being hunched over complicated spreadsheets for hours, and finding yourself staring at the 8th cup of coffee with glazed eyes. The good news is that there are two easy methods for you to get the data you need, quickly and efficiently. The first way, involves downloading orders from your Ecwid control panel into Microsoft Excel, and using Excel’s built in tools to analyze your data. While the second method is far easier and quicker — just install an advanced dashboard app directly into your Ecwid Control Panel. Let’s have a look at both methods. In this tutorial, we will clearly show you how to get started with analyzing your Ecwid data via Excel. 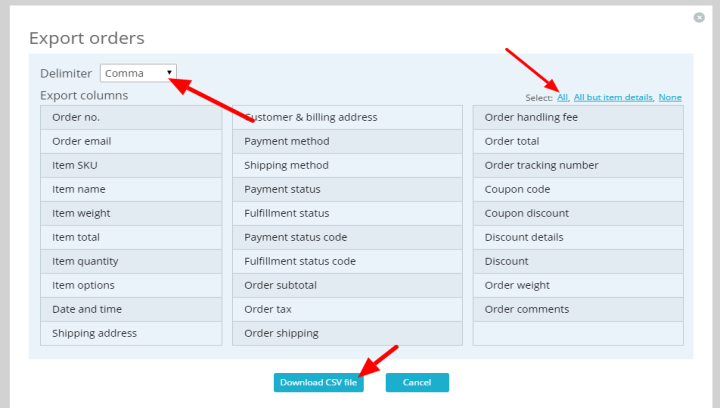 Go to your Ecwid control panel, Click on the My Sales tab, then click on the Orders sub tab. Scroll down and click on the Export All button. On popup screen, make sure Comma is selected in the Delimiter option, and then click on All, and click on Download CSV file button. Upon opening the file you will have 49 columns of data ranging from Column A through column AW, and the same number of rows as the number of transactions you have in your Ecwid control panel. Relax, you won’t be needing to look through all of the data, although it’s a good idea to familiarize yourself with the column headers.It’s important that you when you save this workbook, that you change the csv file to an excel workbook (.xlsx, .xslb, .xls), otherwise the additional tabs and any formulas will not be saved. Now here’s where Excel’s powerful Pivot Table comes into play. A quick primer: Pivot Tables can easily calculate various data for you, without you needing any formulas, sorting, filtering, etc. in the data tab. Create a new tab in Excel by clicking SHIFT + F11, then add a Pivot Table by clicking on the Insert tab, and then click the PivotTable button. A popup window will prompt you to enter the table or range — it is important to note that the column headers in the data range or table must all contain values, if there’s a blank cell in the header row in the selected range or table you will get an error. Report Filter — this allows you to only view results from the filtered option. 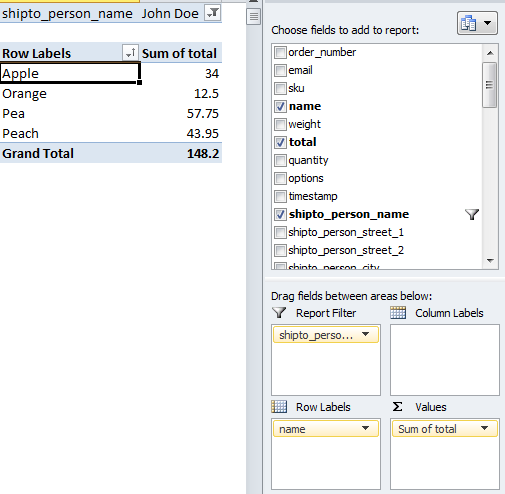 Row Labels — this represents all fields in which the data is in rows and shows values and is not a calculation. 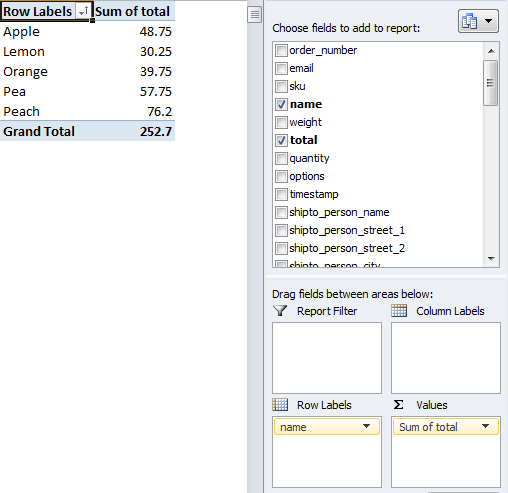 Column Labels — This is similar to the above window, the only difference being this will represent the data across columns. You can have both rows and columns in use simultaneously (a common scenario would have the items in the row window and the year in the column window). Values — The most important field, in which the data can be summed, counted, max, min, averaged, and more. Let’s fill in some basic data: name (that is your product’s name, not sku — however you can put whichever field you like) in row labels window, and total (that’s the revenue per transaction) in values window. 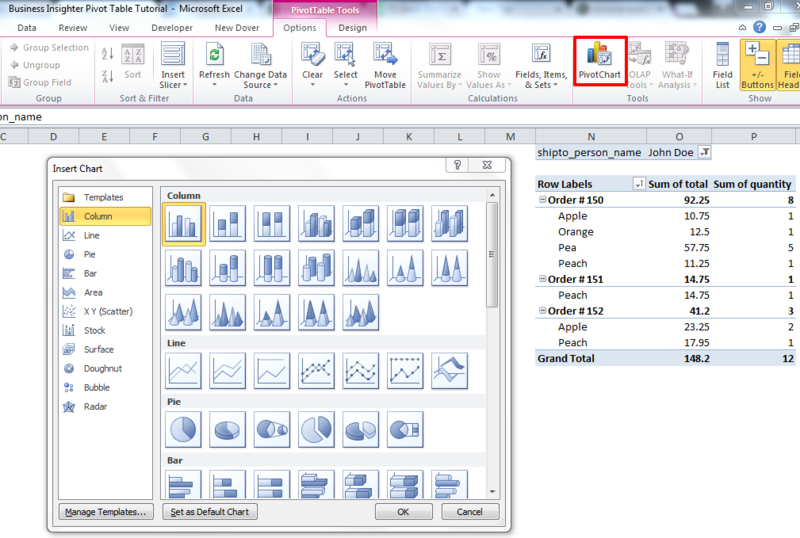 Notice how the items now appear in Excel in rows, and the total amount for that item appears near it. Now, let’s add a filter, for example we only want to see the sales of John Doe. 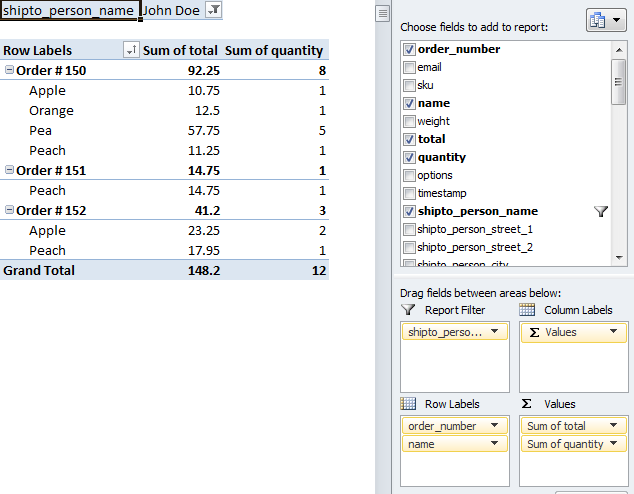 To do that we will place the Customer field from the large window, into the Report Filter window, and the data will be changed to only show John Doe’s data. 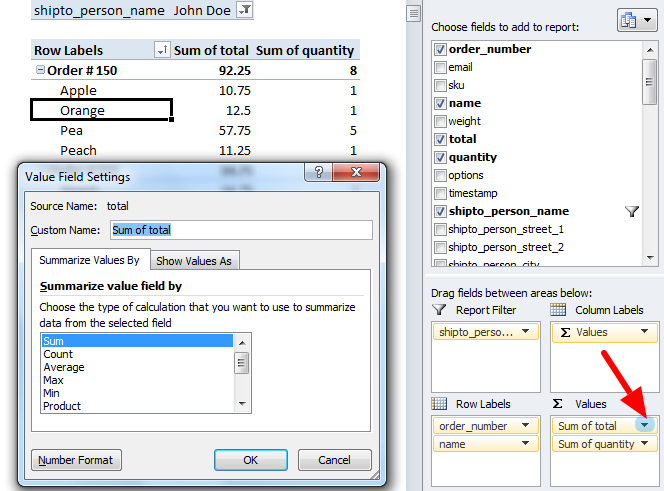 We can add more than one value in a Pivot Table at a time, so let’s go ahead and add the quantity field in the Values window, and the order_number in the Row Labels window. Now there’s another column for each row, as well as child rows for each main row. 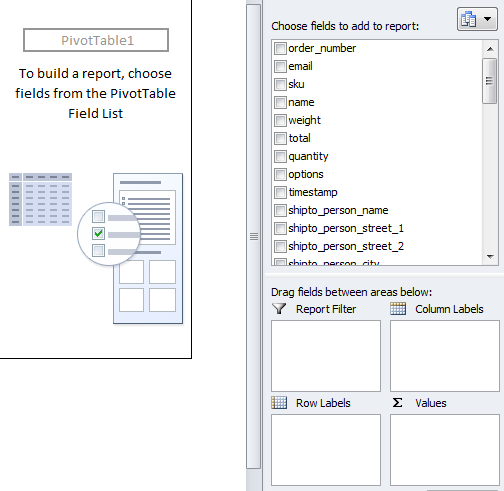 Important to note, that you can move the fields in the windows around, and that order will be reflected in your Excel sheet, that’s why it’s called a Pivot Table. Sum — which totals all the underlying data for that row. Count — the number of times this value appears. Average — Best used if you want to determine an average among a specific dataset. Max — Highest value, very useful when trying to determine latest date. Min — Lowest value, similarly useful when determining lowest value on specific field. There are other options that you’ll most probably rarely use. 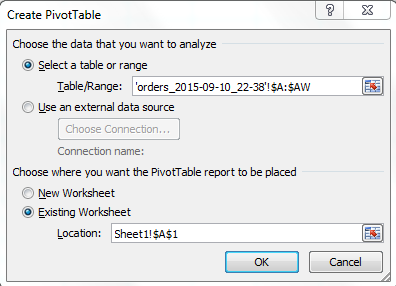 A tremendously useful addition to the Pivot Table, is the Pivot Chart. This chart dynamically visually reflects the data in the Pivot Table. Just as regular charts in Excel, Pivot Charts have a variety of options such as pie, bar, column, and much more. To initiate a Pivot Chart off of a Pivot Table, click on the Pivot Chart button, within the Pivot Table Tools > Options menu. After selecting desired Pivot Chart, you can enhance the way it looks, just as a regular chart. For example, you can add data lines, change chart colors, manipulate axis, dynamic title, and much more. Although there are many advanced uses of Pivot Tables, such as: slicers; timelines; one Pivot Table off of another Pivot Table; calculated fields; and much more, the above tutorial will help you with some basic analysis on your Ecwid sales data. Remember the part at the beginning of this post: there are two easy methods for you to get the data you need, quickly and efficiently? Turns out that the second way is actually far easier, and more advanced! 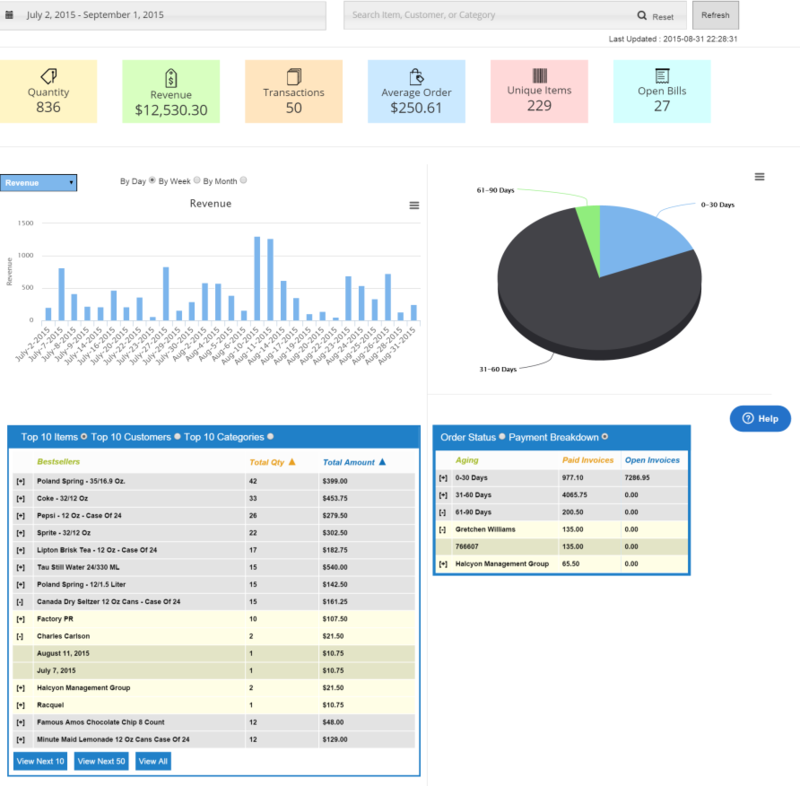 Ecwid users have an option to quickly get a terrific overview of their online sales via our dashboard app. This app is packed with features: key stats; top items, customers and categories; open bills; shipping status; and more, in a beautifully designed and easy to use dashboard. There’s no need to download excel sheets and try to determine what’s selling and what’s not, we do that for you instantly. It is also worth noting, that there are features in here that Google Analytics does not offer. Additionally, in this app you will get to drill down to a specific product and see the various customers that purchased that specific item. Conversely, you can drill down to a specific customer, and see his order status, any open invoices and how long it’s been open for, as well as most frequently purchased items, and more. This app will give you the data you need, in order for you to manage the business you love. Try this app for free with our 7 Day Free Trial — No Credit Card Required.